A one-of-a-kind tasty meal of mackerel cooked with radish and red chili pepper, Godeungo Jorim is a meal that is sure to delight everyone. 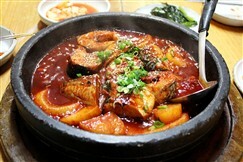 Godeungo Jorim is regarded as the Korean equivalent of chowder or Cioppino. The main ingredient, mackerel, is a fish rich in omega-3 and is good for the brain. The main ingredients are blue mackerel, Korean radish, onions and hot pepper. Potatoes and sliced pumpkins may be added for a change in taste. The broth is made with dried anchovies, and water. The sauce is cooked using gochujang (red pepper paste), red pepper powder, honey or sugar, Korean traditional soy sauce, soy sauce, ginger and garlic. Godeungo Jorim is very easy and cheap to make. Serve with cooked rice for a hearty and appetizing meal. It can also be wrapped with perilla leaf, red leaf lettuce or cabbage for optimum taste and also to reduce its spiciness.